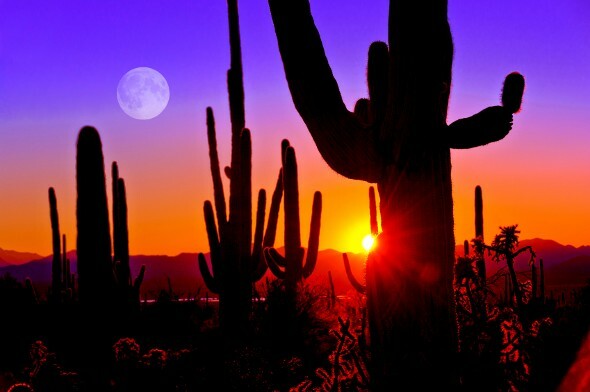 If you love the sun you’ll love Arizona. The Grand Canyon State has a booming economy and a diverse population. What’s more, the cost of living in Arizona is relatively low compared to the rest of the United States. Here’s what you should know about the cost of housing, food, transportation, taxes and more in Arizona. Check out our cost of living calculator to see how Arizona compares to where you live. As of October 2015, the median sale price for a one-bedroom home in Arizona is an affordable $100,000, according to Zillow. The median sale price for two-bedroom homes is $156,000. The median sale price jumps to $191,000 for three-bedroom homes, and $246,000 for four-bedroom homes. The median sale price for all properties in Arizona? $205,000. 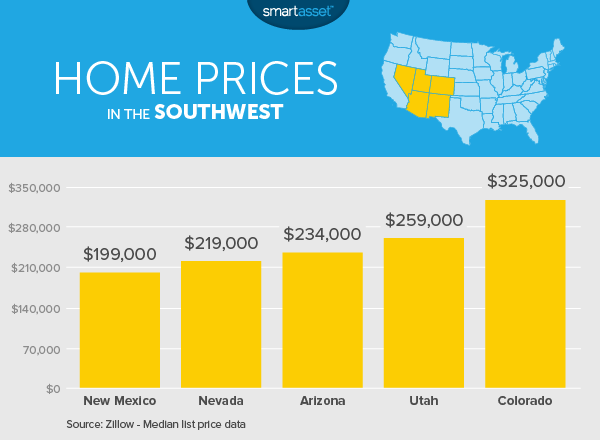 Check out the chart below to see how the median list price for Arizona homes compares to other states in the Southwest. You can see that Arizona is in the middle of the pack. Not sure whether you’re ready to stop renting and buy a home? The good news is that Arizona rent is pretty affordable. The average rent for a studio apartment in Arizona is $725, according to myapartmentmap.com. That’s $346 cheaper than the average studio in the U.S. A one-bedroom in Arizona goes for an average of $809, $188 cheaper than the U.S. average. From there, rent gets more expensive. The average rent for a two-bedroom apartment in Arizona is $1,258. That’s $37 over the U.S. average. If you need three bedrooms, you can expect to pay around the Arizona average of $1,602, $71 more than the national average. Arizona residents pay higher-than-average electricity bills. According to 2014 data from the U.S. Energy Information Administration, the average monthly electricity bill in Arizona is $120.51. That’s 5.6% higher than the national average of $114.11. According to the City of Phoenix Finance Department, the average single-family home in Phoenix has a monthly water bill of $37.75. The Tucson average is much higher, at $53.85. If you move to Tempe, expect to pay around the average of $36.16. Mesa? $44.11. Glendale residents pay an average of $37.26. To help you manage your costs while building your finances, check out some of the top financial advisor firms in Scottsdale, Arizona. According to numbeo.com, a Tucson resident needs a minimum of $273.13 to spend on food each month. Numbeo’s estimate for Mesa, Arizona is similar at $264.38. Want to live in pricier Phoenix? Numbeo estimates you’ll need a minimum of $318.02 for food each month. These are just the minimums. If you want to eat in restaurants or buy anything other than the bare necessities you can expect to pay more. A gallon of gas in Arizona goes for an average of $2.004, a little under the U.S. average of $2.018. Prices are even lower in Phoenix at $1.976 per gallon and Tucson at $1.866. Commute times in Arizona are around average for the U.S. The average commute in the Phoenix-Mesa-Scottsdale metro area is 26 minutes, similar to the national average. In Tuscon, commutes average 25 minutes. If you’re not big on driving there are public transportation options, too. A 31-day pass on Phoenix’s Valley Metro will cost you $64. A 30-day pass on Tucson’s SunGO costs $42. A 31-day pass on Glendale’s Beeline bus? $36.00. Of course, you’ll need to make sure that you can get between home and work on public transportation if you decide to go car-free. Income tax rates in Arizona range from 2.59% to 4.54% depending on your bracket. That’s on the low side for state income taxes in the U.S. Sales tax in the Grand Canyon State is high, though, with rates that range from 5.85% to 10.7%. The base state sales tax rate is 5.6%, but counties and cities add their own rates on top of that. Arizona’s sales taxes are the ninth-highest in the nation. On the positive side, Arizona has an average effective property tax rate of just 0.84%, lower than the national average. It also has the seventh-lowest gas taxes in the nation, at 19 cents per gallon of regular gasoline and 27 cents per gallon of diesel. According to Castlight Health, the average price of a visit to a preventive primary care physician in Phoenix is $114. Prices range from $72 to $379 and are up 9% since 2014. When it comes to health insurance premiums, a 40-year-old non-smoker who earns $30,000 a year can expect to pay about $207 in 2016 for the lowest-cost silver plan. Check out the chart below to see how this compares to health insurance premiums in Arizona in 2015. Want to visit the Grand Canyon while you’re in the Grand Canyon State? We don’t blame you. A Grand Canyon National Park vehicle permit will cost you $30. Don’t want to bring your car? An individual permit is $15. It’s for anyone “entering by foot, bicycle, park shuttle bus, Grand Canyon Railway and private rafting trip.” If you’re with someone 15 or younger that person can get in free. Admission is free to all visitors on certain national holidays listed here. Grand Canyon not your thing? Why not check out some spring training baseball games in Arizona’s Cactus League? Half the country’s major league baseball teams train in Arizona, across 10 stadiums. Unfortunately for bargain-hunters, Cactus League ticket prices have been on the rise. But there are still some cheap tickets to be had if you’re willing to sit on the lawn. For some games, advance tickets start at just $8. Moving to a new state can have a large impact on your budget. It’s important to know about the tax implications – not just on your income but also on your property taxes and your paycheck. If you are moving to Arizona, you probably want to see how your budget will be affected. If you want help with how it will impact your finances or are looking for someone to help you meet your financial goals in general, a financial advisor might be useful. A matching tool like SmartAsset’s can help you find a person to work with to meet your needs. First you answer a series of questions about your situation and your goals. Then the program narrows down thousands of advisors to three fiduciaries who meet your needs. You can then read their profiles to learn more about them, interview them on the phone or in person and choose who to work with in the future. This allows you to find a good fit while doing much of the hard work for you.